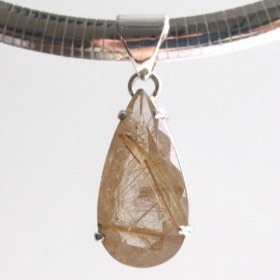 Golden rutilated quartz is clear crystal quartz with suspended golden rutilations. These golden needles are often referred to as Venus Hair. 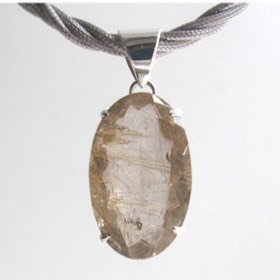 Here is a collection of premium quality golden rutilated quartz pendants. 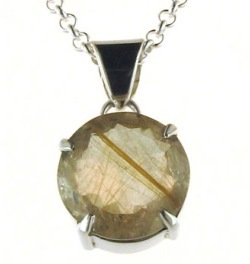 Chosen for the clarity of quartz, cut and rutilation pattern, these pendants are all unique. Claw set in sterling silver and open at the back to allow light through the stone. 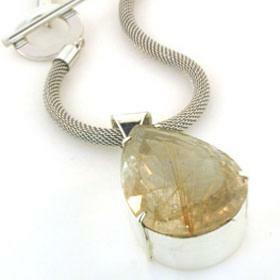 Tear drop golden rutilated quartz pendant set in sterling silver.